Push presents are becoming increasingly popular as more and more partners are eager to commemorate and reward new mothers for giving birth – a major milestone in life. As you and your spouse embark on a life of parenthood together and forever, consider giving titanium rings with diamonds to mark the occasion. Why Choose Titanium Tension Set Ring? Giving your partner a titanium ring set with precious stones is something she can cherish forever. Aside from being aesthetically pleasing, titanium jewelry also has a number of practical advantages that she will truly appreciate. Titanium is a hypoallergenic precious metal making it a great choice for those who have allergies to certain types of metal. Additionally, recognizing that new mothers will be hustling and bustling around the home, titanium is lightweight, comfortable and best known for its strength and durability. Keeping this in mind, it’s the perfect everyday accessory for mothers because it’s resistant to bending, dents and scratches. In addition, the ring will make a fantastic heirloom you can pass onto your child as a reflection of your shared happiness when he or she became part of the family. Lastly, it’s relatively more affordable. Compared to other metals like platinum and gold, titanium is a long-lasting metal and costs only a fraction of the price tag. Titanium rings with diamonds as a push present will show your wife how much you support and appreciate her. It can also highlight the shared journey you’ll be embarking on as parents. Our titanium rings at Titanium Style make use of tension, not prongs, to hold the gem set securely enabling more light to penetrate the stone resulting in a more brilliant sparkle. As an alternative to diamonds, you may opt for precious gemstones, maybe that of your newborn or partner, to make the item more personal. 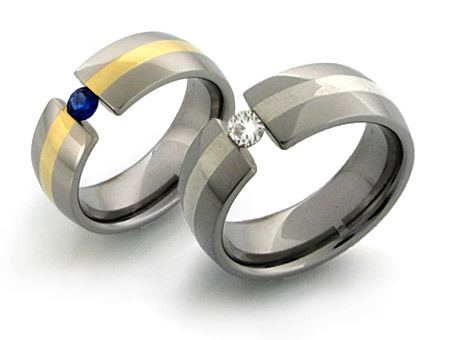 Titanium Style offers a fine selection of jewelry for both men and women. 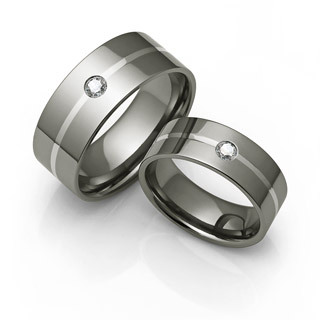 To make the present even more meaningful, how about matching your partner’s ring? We recommend a custom inlaid titanium ring because of its stylish, elegant yet understated look. Make these accessories a special symbol of the love, happiness and commitment you share with your significant other. Other than rings, we also offer titanium necklaces, pendants as well as earrings and bracelets. If you’ve got something in mind that isn’t in our online catalog, we accept custom orders that will enable you to design and create the ideal piece of jewelry. Get in touch with us and let us work together to craft your one-of-a-kind gift that your partner will adore for years to come.